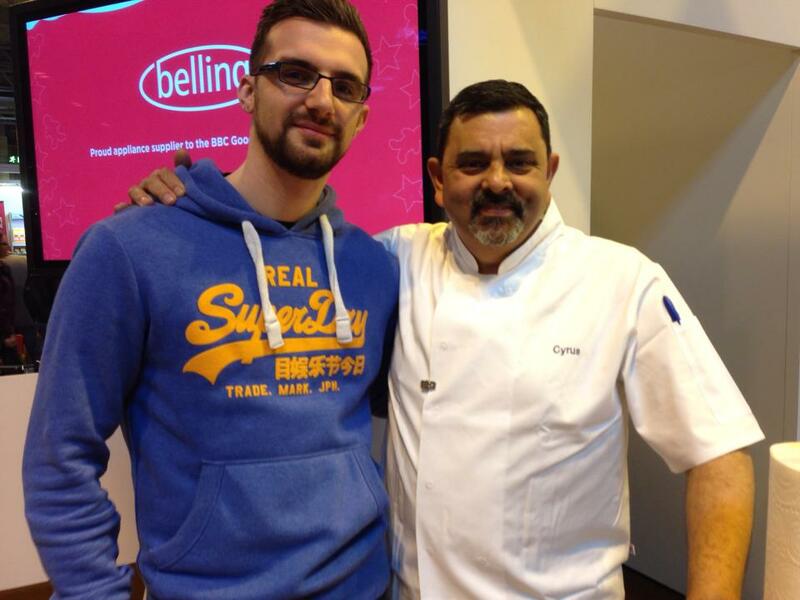 December 1st 2013 marked my first visit to the BBC good food show winter at the NEC in Birmingham, offering a day full of food and drink and a chance to meet some great people with similar passions for the edible delights our world has to offer. There were plenty of celebrity chefs rolling around the halls to grab a quick chat with some real giants of the food entertainment industry, and it was quite surreal to meet some of my own media influences. 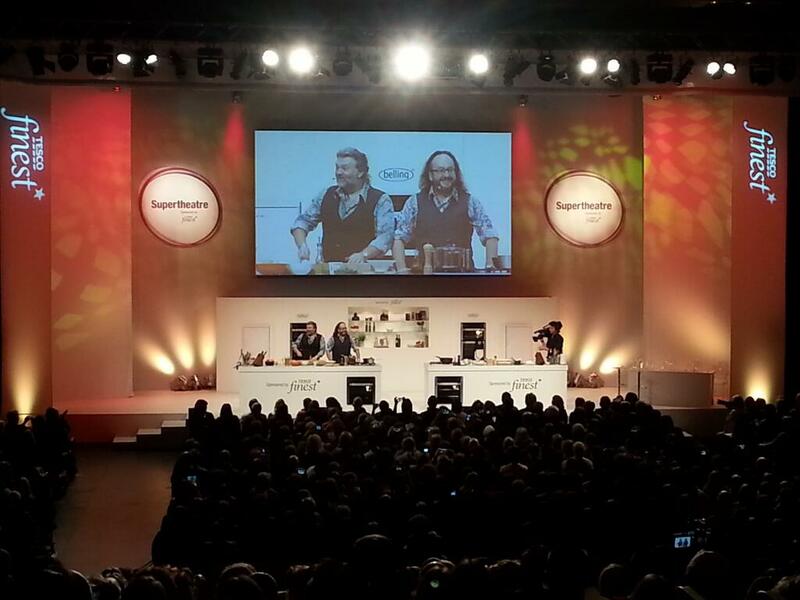 We purchased the tickets fairly early at a charge of around £25 each with a ticket to the super theatre show with the Hairy bikers, two of my favourite TV chefs (also quite easily a two of the nation’s nicest people, as I found out). We got their early enough to park relatively easily and made our way down to the main NEC halls, accompanied by a growing hoard of other tired looking hungry people. We entered the hall at around 9:30 on the button, this being fairly early for a Sunday morning everybody’s heavy looking eyes and drooped shoulders in the queue were absolutely justified. The perfect tonic however was the smell of the supreme sausage stall cooking their wild boar and apple sausages www.supremesausages.co.uk, The smell crept around the peripheries of the show, right by the exit, for the entirety of the day making it possibly my favourite place to stand throughout the day. Before we had chance to start trying any food we had to dash to the super theatre to catch our early morning appointment with Si and Dave, the Hair bikers. I initially thought it would be a lot more intimate and was a little concerned with how back our seats were, but I have to say it was set up perfectly. Having the monitors behind them so you didn’t miss a trick was great and the sound work was great meaning you could hear it all happening, it really was worth the ticket price just to see them work their magic with the crowd and the food. They really are more than just talented cooks, they are natural entertainers and made everybody laugh while really getting people involved in their show, it really was an enjoyable experience. After around 40 minutes, the show finished and we were released upon the rest of the show to view the stalls and start getting some decent food in for our late breakfast, so naturally we made a break for the supreme sausage stall again. Upon browsing the range they have to offer it was apparent we had come across something special, but I will go into this in more detail later. I had a million and one ideas that I could use the sausages for (check out the recipe in the prior post for a good one), and we really weren’t disappointed with what we tried. We ended up buying two packs the wild boar and apple with a pack of the venison, pork and mushroom sausages and at £10 for the 3 I can’t complain at all. 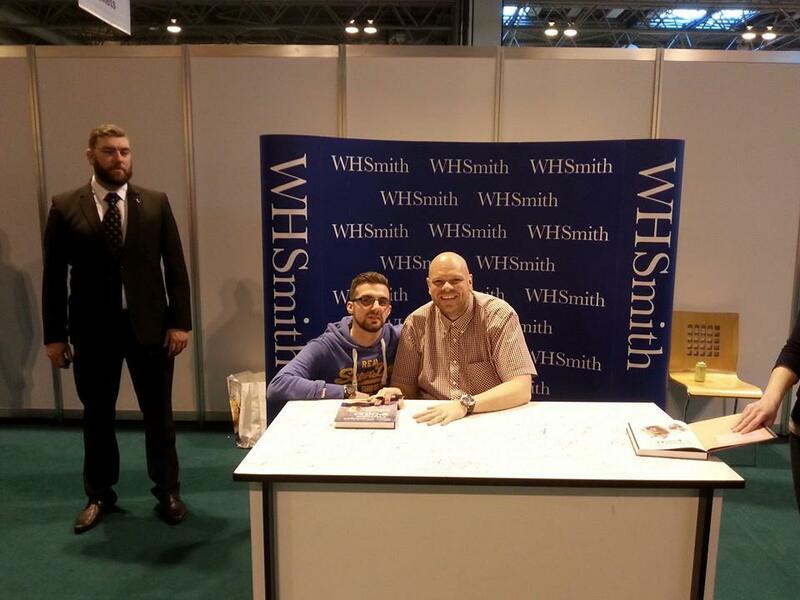 The W.H.Smith stand provided an opportunity to buy and get your books signed by some of the celebrity chefs in attendance, but their strict ‘one book to one person’ rule was a bit harsh but I do understand why it was in place as the queues got a little bit hectic. 5: I am not known to be a drinker but towards the end of the show we uncovered a stall doing a variety of flavoured alcohol, there was a few flavoured vodka’s and a really refreshing limoncello which I enjoyed quite a lot. The star of their range was raspberry vodka, which I must say tasted amazing, but dangerously not like alcohol! A definite winner though and I would recommend them to anybody, unfortunately, I can’t remember the name of the company and I cannot find them on the exhibitor list so I will update this if I find out who they are. 1: Already mentioned and deservedly so, Supreme sausages. Amazing. This company provides some of the best flavour combinations found in sausages that I have encountered, being somebody who loves game and other alternative meats they really do cater for my tastes. We both agree that they deserve the number one spot purely down to the fact that eating that first sausage kept them on our minds all day. Not only did the initial sausage make us marginally fall in love with their produce but the ones we took home created some great meals that pushed us further over the line. Their range includes (As mentioned above) the venison, pork and mushroom, the wild boar and apple along with the Toulouse, Cumberland, the fire sausage, pork with tomato and black pepper, pork with honey and mustard and also lamb and mint to name just a choice section of their range. They also offer an online delivery service guaranteed delivery within 24 hours of despatch, packed with icepacks in polystyrene boxes to guarantee they maintain their freshness en route. 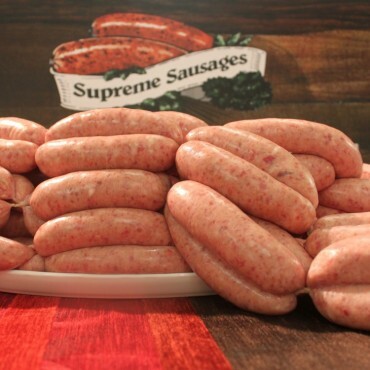 Visit www.supremesausages.co.uk to order yours or to find out more. Other honourable mentions are, the Cheshire cheese company, the Snowdonia cheese company, the arm and hammer soda mixology stand, Lakeland, the world cheese awards (never seen so much cheese! ), The potted game company. Overall the show worth every penny of the entrance fee and I would recommend it to anybody who loves food. The next one is in July just in time for all your summery gluttonous needs, Fingers crossed ill see some of you there, in the meantime visit the links and help support these great companies! This entry was posted in Uncategorized and tagged alcohol, apple, article, bad, bake, BBC, biker, bikers, Cake, cares, celebrity, cheese, chef, cheshire, company, cyrus, Cyrus Todiwala, day, day out, drink, eat, eating, england, enjoy, expo, famous, Food, fun, good, grammar, hairy, hairy bikers, hero, like, love, meat, NEC, Order of the British Empire, Pork, produce, sausage, show, simple, smile, Snowdonia, Sunday, tv, uk, vodka, watch, who, wild boar, write, writing. Bookmark the permalink. Wow. Sounds like a great time! Good stuff. Unlike you, I’m quite the drinker, but even with my love of alcohol, I think the food at this place would capture my attention more. Thank you thats high praise indeed. Ill be there with you! Fantastic day out! This looks like a great event and a lot of fun! I’m inspired to visit more live food events next year after reading this. Thanks, was a great day!